Earlier last month, Paramount was thinking about pushing back Martin Scorsese‘s The Wolf Of Wall Street starring Leonardo DiCaprio, Jonah Hill, Kyle Chandler, Matthew McConaughey, Margot Robbie, and Jon Bernthal, to 2014. While the film hasn’t budged from its original November 15 release date, it has been reported that Scorsese is still hard at work editing the film to an appropriate runtime. Now a new report coming out confirms those editing difficulties, but the release date may not be as drastic as pushing it back all the way to 2014, which would mean that the film would still be in contention for some Oscar awards. According to sources, Scorsese, along with his longtime editing partner Thelma Schoonmaker, is hard at work cutting the film and determined to finish editing it by November 25. One of the reasons for the delay is that Paramount wants Scorsese to whittle down The Wolf Of Wall Street‘s three hour run time to two hours. But the reason for why Scorsese is eyeing completing editing the film by November 25 is because he’ll be a judge at Marrakesh Film Festival. But that November 25 date is crucial because the film’s marketing campaign has been nonexistent, aside from the one amazing trailer that was released a few months back. Of course a December 25 release may not be so bad. 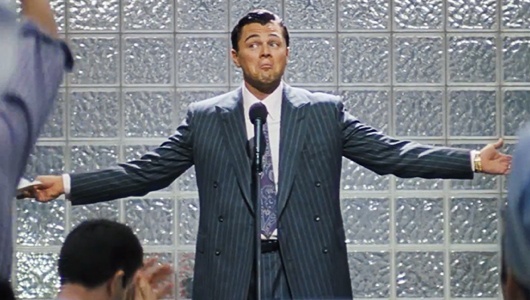 It still puts The Wolf Of Wall Street in contention for some Oscars. However, it also means that Jack Ryan: Shadow Recruit would have to be pushed back as that film is also under the Paramount banner. Should that happen Jack Ryan: Shadow Recruit could see a mid-January release.